BRINGING TOGETHER A GROUP OF PRACTITIONERS USUALLY ON THE PERIPHERY OF MUSICAL CULTURE, LIQUID ARCHITECTURE PROVIDES AN IMPORTANT FORUM, RAISING THE PROFILE OF SOUND ART AND BRINGING IT TO A LARGER AUDIENCE. IN DOING SO IT HAS ADAPTED SOUND ART MODES OF PRESENTATION RATHER THAN THE TRADITIONAL INSTRUMENTAL CONCERT MODEL. IN NORTH MELBOURNE TOWN HALL SIX CHANNELS OF SOUND SURROUND THE AUDIENCE, SEATED IN A CIRCLE, CREATING AN IMMERSIVE LISTENING ENVIRONMENT. LISTENING BECOMES A MUCH MORE INWARD EXPERIENCE. THE AUDIENCE ENTERS A MEDITATIVE SPACE, DRAWN TO SUBTLETIES IN THE SOUND AND THE KINAESTHETIC SENSATIONS THEY EVOKE. Making effective use of the multi-speaker setup, Jacques Soddell presented a work that sent field recordings, samples and white noise sliding around the space. Not afraid to use single sound sources with gaps and silence, this work slowly developed out of simplicity, often returning to samples almost as a kind of recurring theme. Rod Price presented a work similar in its use of field recordings and synthesised sound, although combined in a way to create a darker and heavier atmosphere. Sound masses would often build, colliding with other loud gestures, creating a sense of immediate impact and whiplash. Canadian artist Robert Normandeau, a highlight of this year’s program, presented a three movement work with a subtle control of dynamic, dispersing sound around the space to dizzying affect. These works, characterised by voices murmuring and chattering, stood out in the way they used sound to create a feeling of movement, shifting energy and momentum skilfully between medium, fast and extremely fast. French artist Cedric Peyronnet’s was also a standout performance, masterfully combining field recordings from the French countryside to create surreal atmospheres, building to levels of high intensity and energy. Taking a different tack, Lawrence English’s work began exploring the lower end of the volume spectrum. Distorted shards of low pitched timbres were gradually layered to build a slow moving and ambient texture. Particularly interesting in this work was the beating of sound waves, caused by slight discrepancies in pitch. German artist Andrew Peckler opted for a lighter and more playful approach, presenting a work largely built upon harpsichord and celeste samples. These semi-melodic fragments, combined with oscillators, ring modulators and a modular synthesiser, gradually evolved into a predominately rhythmic piece. Breaking from the mould, Peckler’s work might just as easily be heard in a club—a real break with the austerity and seriousness usually felt at these town hall performances. To Peckler’s credit, this piece had buoyancy and colour created through pitch organisation and contrasting rhythms, even if at times the drum ‘n’ bass-ish sections did feel a little out of place. 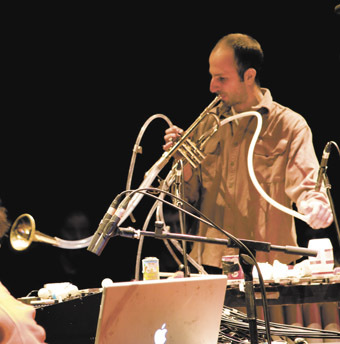 The collaborative ensemble Metalog comprises Jim Denley (alto saxophone), Amanda Stewart (voice, text), Natasha Anderson (contrabass recorder), Dale Gorfinkel (vibraphone, trumpet), Robbie Avenaim (percussion) and Ben Byrne (tape and electronics). Focussed on bridging the gap between laptop and instrumental performance, Metalog presented a work with a diverse sonic spectrum, yet with a feeling of ensemble interaction and collaborative composition. Denley’s gurgling water through his saxophone, Stewart’s lip chattering and the motor on Gorfinkel’s vibes repeatedly striking various objects provided a charactersitic Metalog layering of sonic planes of various timbral densities. These larger gestures were punctuated throughout by shorter rhythmic shapes, mainly articulated by Denley and Anderson. The success of this work came from the bringing together of six very compatible artists, always listening closely, never cluttered, and maintaining their distinctive voices while sustaining a strong aesthetic direction throughout. As in much of Liquid Architecture 9, the sounds generated by the works fell outside traditional musical syntax, encouraging the listener to become absorbed in the very sound itself.